My cats are always popular - these are colorful and creative! Inspired by a long, hot drive to Baja a couple years ago. This hand-pulled hand-colored woodblock print shows there is live in the desert. Featured in the 2011 exhibit on the Slough at the National Steinbeck Museum - this gives you a glimpse of this overlooked watercourse in the Monterey Bay Area. Passion pushes the color limits of printmaking in ink and paper. OK my webmaster finally got to work - 11 new prints in the gallery! Prints from the home of Albrecht Durer - Back in Europe again! Leben ins Nordbayern sind wunderbar! I've been traveling and drawing and printing and teaching and... Castles, Fortresses, the Frankische Schweiz, our Kulm, wonderful mountains and forests. New prints are going online this month. The heart of every relief print is the block. Click on the photo to the right to see a high res image of the San Antonio Bell block in the process of carving. The 3 Hr description shows the portion of the block that it took me 3 hours to carve. All my prints are personally hand pulled in very limited editions. Katherine Stutz-Taylor is a Printmaker and Multimedia Artist with two strong directions in her art, realism and symbolism. 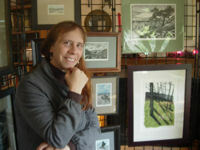 Her current etchings are edition varieis that include hand coloring and chine collle. Her wood cut and linoleum relief prints are images she has drawn and photographed. Printmaking has been a vibrant thread in her life since she began over 30 years ago. My work has been exhibited at the National Steinbeck Center in Salinas CA, the Triton Museum in Santa Clara CA, the San Jose Institute for Contemporary Art in San Jose CA, and the Sturm Gallery in Reno NV. In addition my work has been juried in to many regional shows in the West including Santa Cruz Open Studios(for over 14 years), The Contemporary Crafts Market in San Francisco, the Los Altos Rotary Art Show and the KPFA Crafts and Music Fair. A selection of my work is always available for viewing and purchase at the Salinas Valley Art Gallery. All my mission prints are available at Mission San Antonio and a portion of the sale support the mission. Please visit them soon! Tell Frankie - Kathy sent you!